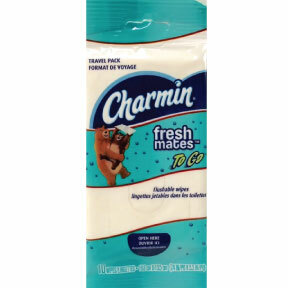 10 flushable moist wipes in resealable travel size package. Pair your Charmin toilet paper with Charmin Freshmates to feel fresh and clean. Cloth size: 5.6 in X 7.5 in. Septic System Safe. Ingredients: water, citric acid, PEG-40 hydrogenated castor oil, sodium citrate dihydrate, benzyalcohol, phenoxyethanol, sodium benzoate, BIS-PEG/PPG-16/16 PEG/PPF-16/16 dimethicone, caprylic/caprictriglyceride, disodium EDTA, xantham gum, fragrance, ethylhexylglycerine.